Are there underrated dog-friendly assets to highlight in your destination? Of course, cute animals are always a good idea. 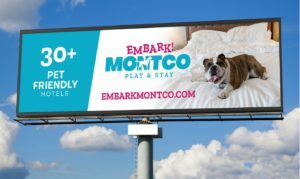 We’ve learned that Ed also helped himself to another good animal idea to take back home to Montgomery County, PA.
See the presentation, “There’s Riches in Those Niches” for a close look at dog-friendly destination marketing in Visit Vacaville, CA with DogTrekker.com.